'NSW desert plants' 2011 was inspired by the vast desert landscapes of Fowlers Gap near Broken Hill, when Keeler-Milne joined twelve other prominent artists on a unique artist's field trip in 2011. A fortnight of intense creative activity in the field, followed up by months of serious studio work, resulted in a major body of works exhibited at the National Trust S.H. Ervin Gallery, Sydney, and regional New South Wales, in 2012-13. 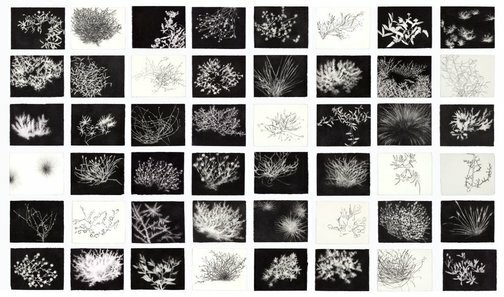 Each carefully wrought charcoal drawing in the 'NSW desert plants' suite is an intimate encounter with the landscape; turning her back on the vast spaces and magnificent vistas of the desert, the artist turned to close observation of the plants, such as scrubby salt bush, that lay around the property. The drawings are not botanical studies, but rather poetic evocations of the beauty and variety of our native flora, which can be so easily overlooked in the vastness of the dessert. They present an alternate view of the Australian outback, a well established and ongoing subject for many Australian artists over the past century. James Compton, Artist profile [issue 18] , 'Figures in the landscape', pg. 62-75, St Leonards, 2012, 62-63 (illus., detail), 74 (illus., detail), 75 (illus., detail).